Composed by Fred Sokolow. Style, Solos, Duets & Ensembles, Boxed, Technique, Theory and Reference, Rock. Grossman Guitar Workshop. Blues. DVD. Duration 80 minutes. Grossman's Guitar Workshop #GW404DVD. Published by Grossman's Guitar Workshop (MB.GW404DVD). If you want to play blues guitar like B.B. 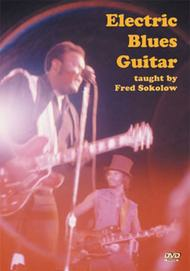 King, Eric Clapton or Buddy Guy then this 80 minute DVD will get you on track. Starting at the beginning with first-position key-of-E blues licks, Fred Sokolow shows how to play lead and backup like a modern blues guitarist. You'll learn: Several moveable scale patterns and licks for soloing. Moveable chords and chord based licks for backup. How to play melodies, chord backup and improvised solos on blues classics Stormy Monday, Everyday I Have The Blues, Killing Floor and Baby Please Don't Go. Intros and endings. Enough theory to understand the 12-bar blues structure and be able to play backup and solo in any key. Boogie bass lines, vibrato, note-bending and more. Level 2, a detailed tab/music instructional booklet is included as a PDF file on the DVD.